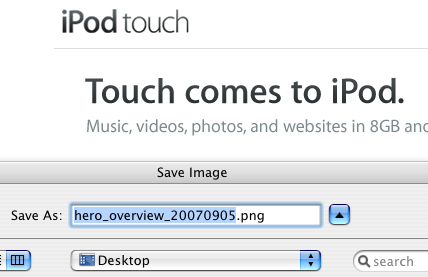 Was the iPod Touch codenamed “Hero”? Hero, huh? That sounds about right. Can anyone at Cupertino or elsewhere confirm this? I’ll have mine before the end of this month. I didn’t get the Touch. I got the Classic. It will be here in 3-5 business days! And a discount to boot! Can’t beat a deal! Clint beat me to it, but yes, he’s correct. Apple’s three quarter view shots are generally referred to as “hero” shots. I noticed it back when I used to create Apple product brochures for my college’s bookstore. You can get high resolution images from Apple’s PR site, and some of them will be referred to as a “hero” shot.